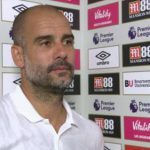 Pep Guardiola has demanded an explanation from officials on why Raheem Sterling was sent off after scoring a last-minute winner against Bournemouth. The England winger saw his last-gasp effort deflect in off Andrew Surman to seal a dramatic 2-1 win for City. Sterling’s joy was relatively short-lived as referee Mike Dean showed him a second yellow card for celebrating with the jubilant away fans. Guardiola was frustrated with the officials for the second time in a week following Kyle Walker’s sending off in controversial fashion against Everton. “Maybe someone can call me as I don’t understand,” he said. “He went over to celebrate and he came back. So I don’t know what happened – I would like to know. Now he won’t be able to play against Liverpool. Guardiola also felt Bournemouth defender Nathan Ake should have seen red in the first half – but the Holland defender was only booked for a trip on Jesus. Charlie Daniels produced a ferocious strike off the crossbar from a narrow angle to give Bournemouth the lead, but Jesus stabbed home from David Silva’s wonderful through-ball to equalise. But Guardiola was delighted to see City grab the winner amid a frenetic finale. “We are happy with the victory especially after they scored such an outstanding goal,” he said. “We didn’t miss any balls. That’s why we had just one striker so we could win the ball in midfield. But in the early period they missed the balls, which is always a danger. After Daniels’ goal we played quite good – we could’ve scored one or two goals. We tried to attack against eleven players defending. We tried to play the channels with players running in behind.